Baltimore City has a law that stipulates there is to be no panhandling of motorists in cars on the streets. The law is not enforced by the police. Nor do the politicians or The Sun encourage the enforcement of this law, and that is why a woman was murdered in cold blood. On Friday, Dec. 7, a homeless panhandler pulled a gun from his breast pocket on Market Place and Water Street. Private security disarmed the “homeless gentleman” and called the police who eventually responded, but refused to arrest the “homeless” or even cite him. Under the relentless pounding by a succession of mayors, encouraged by The Sun, the police have been told to “stand down,” and so they are. The citizens who live, work and visit the city also have rights. Said rich dude doesn’t seem to realize that panhandling of motorists, while illegal in Baltimore, is a misdemeanor, a traffic-related misdemeanor. So I suggest we enforce all traffic related misdemeanors strictly. 26 mph in a 25 mph zone? Wham! You get a citation! Bulling your way through a crosswalk? 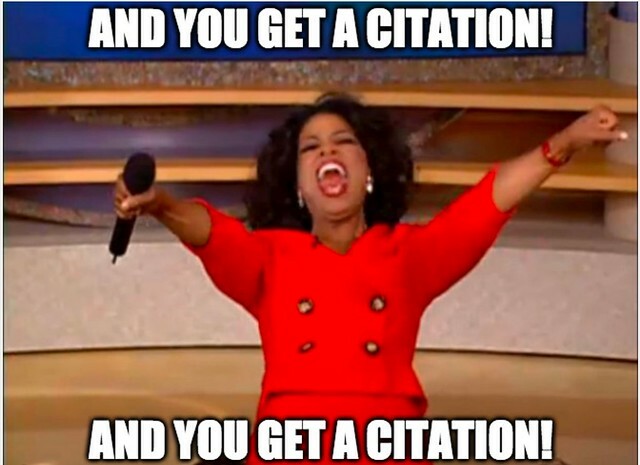 You get a citation! What many people seem to forget–and not just the rich, though they’re especially susceptible to this–is that if someone were to follow you around all day, they could easily ring you up on a misdemeanor. It’s not hard at all. And from my perspective, I’m far more concerned about bad drivers killing me than I am panhandlers doing the same. So let’s enforce all the misdemeanors and see how that works out. This entry was posted in Basic Human Decency, Ethics, The Rule of Law. Bookmark the permalink. Panhandler had a gun? Why didn’t he just pawn the gun for money & use that for food (or booze or drugs)? That’s the first thing you do when you have something of value & you need money. There’s something wrong with this story. No. The murderer – the man doing the work and using the woman panhandler as bait – used a knife, not a gun. Of course. Mike hates the makers so much that he doesn’t care about them being murdered. All he cares about is ranting against those proven by their very success to be his betters.